What?!? Why are you doing this? David. You already HAVE a blog. You can sometimes barely keep up with deadlines there. WHY on EARTH do you need another one? 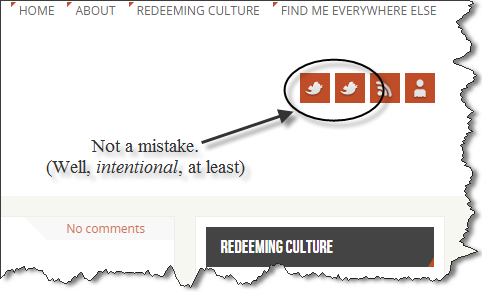 So, I started publishing Redeeming Culture articles weekly in September of 2014, about a month before my son Calvin was born. By God’s grace, I haven’t missed a week since. And it’s been an incredibly fulfilling experience. But I can’t talk about everything on RC. I’m a programmer and hobbyist designer, for example, and that stuff doesn’t usually appear on RC. My life is not more than the glory of God, but it is more than exploring that glory in culture we create. Don’t worry, this site won’t be nearly as frequently updated as RC is. Although from time to time, if I have something interesting to say, I might post something about a recent RC article. But I hope you have fun here. If I do, everything is going as planned; if you do, I’d be ecstatic. Enjoy!